Wow. I really do get an “E” for effort with today’s photography don’t I? Look at the state of my desk behind! Sometimes I don’t know how I manage to get any actual work done – I spend quite a lot of my time moving things about so that I can actually fit the mouse mat on the desk! 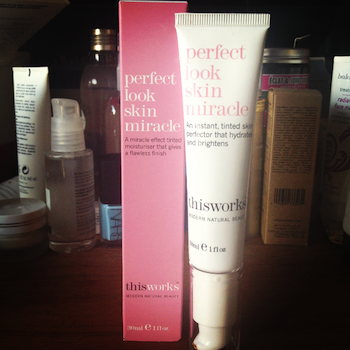 Anyway, it’s quite telling that the Perfect Look Skin Miracle is right in front of me on my desk, because that tends to be the place where my most-used products go. Within easy reach, within my immediate grasp, ready to be played with and tested and written about. This isn’t a BB Cream and it’s not really a tinted moisturiser, either, though it is tinted and it is a moisturiser. It doesn’t have any skills in the coverage department, but what it does have is a healthy, bronzed sheen without being greasy or sticky or stodgy. It’s beautiful. You could use it beneath a foundation, but I almost think that it would be a shame to cover it up. I have been using it on my no makeup days, on good-skin days, on days when I just want to look alive and well but not glam or “done”. For anyone with good skin, who likes to wear minimal makeup, this is a bit of a find. Of course if you want coverage, or need to hide blemishes, red patches, dark spots and so on, then you might look to something a little more pigmented.